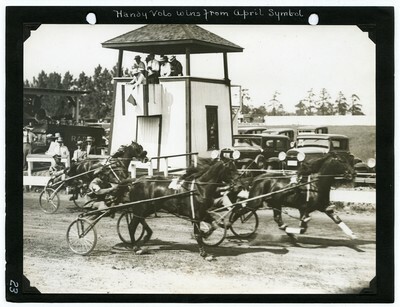 Black and white finish line action photo of the second heat of the Foals of 1928 Pace on July 3, 1931 of the Bay State Circuit, Sage Park, Windsor, Connecticut. Brown colt, Handy Volo driven by E. Kirby is in first place. Brown gelding, April Symbol driven by H. Goodhart, wearing number 3, placed in second place. Bay gelding, Peter Guy driven by W. Hodson, wearing number 2, showed in third. Baron Lee, the fourth colt in the race and not shown in the photo, finished last.